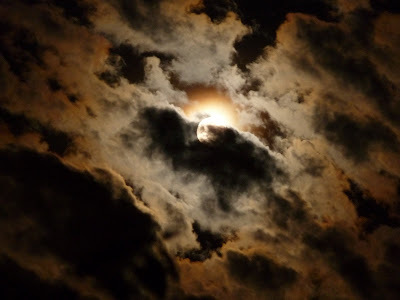 A bad witch's blog: Harvest Moon, Singing Moon or Barley Moon? Harvest Moon, Singing Moon or Barley Moon? There is a full moon this weekend. If you live in England, it is at 4am on Sunday morning, September 30, to be precise. According to the online pagan calendar, the medieval name for the late September full moon is Barley Moon, the Celtic name for it is Singing Moon, while the neopagan name is Harvest Moon. I'm not really sure which of those names I like the most, so I thought I put out the question: What do you prefer to call the full moon at this time of the year? The photo above is copyright Anne Reckless. I don't have names for any of the moons - but I like Singing Moon. Does it sing or am I supposed to? I don't know why it is called singing moon. I rather like the idea of singing to the moon and hoping the moon will sing back. I'm partial to harvest moon but mostly because one of my favourite bands has a song with that title :-).